Connect your Rentec Direct account with the leading rental inspection software from zInspector to make rental inspections easy and efficient. You can mark property features as New, Satisfactory, Damaged, or Needs Attention and input notes and take pictures directly from the app. This new integration between Rentec Direct and zInspector allows you to download your property information into zInspector to complete rental property inspections on the go with the zInspector mobile app. The zInspector mobile inspection app allows you to click-through an inspection checklist on your phone, take photos that are automatically attached to an inspection report, and generate downloadable PDF reports to be shared and stored. The inspection app delivers a convenient way for landlords and property managers to complete inspections on the go to make move-in and move-out processes faster. When you think about the fact that there are over 4 types of rental inspections required per lease, inspections can create a lot of overheard that an inspection app will minimize. The zInspector tool is a native app that you can download for free from the Google Play Store or iTunes. To complete an inspection, you do not need an internet connection when using the mobile app. To better serve our clients, Rentec Direct is happy to announce a new integration with zInspector that allows you to sync your properties directly into zInspector. This integration means you do not have to manually enter any property data to complete a rental inspection through zInspector. The zInspector mobile app turns your smartphone or tablet into a powerful property documentation tool. You can perform photo inspections, take notes, and perform move-in / move-out inspections of a property right from your mobile device. All of your inspection photos and notes are cataloged and stored in a secure Amazon server for instant access whenever you need it. Our app even allows you to do iPad property inspections!Every photo you take with zInspector can be tagged with a creator, date, time, property, activity, area, detail, action item, and comments. All of your photos, inspections, and property data are stored securely in the cloud. They are automatically synced across all of your mobile devices and computers, so that you can access the information you need from anywhere. Are you looking for that one photo in a thousand? zInspector’s powerful search and sorting capabilities allow you to search by property, activity, or date so that you can quickly and efficiently find the photos and inspections that you need. With a zInspector group account, you can track the work of your employees and grant them varying levels of access privileges. Organizing your photos and inspection forms to share with owners and tenants is difficult and time-consuming. zInspector uses your photos and inspection data to instantly generate customized, professional PDF reports that you can email to owners or archive in Evernote. You can also upload to your file library in Rentec Direct. With zInspector, all your properties, inspections, and photos are secure, available, and organized. zInspector is the most feature rich and affordable rental inspection app on the market, which is why Rentec Direct selected it as an integration partner. zInspector is free for anyone with under 5 units and starts at $12/month for 1 user with unlimited properties to conduct an unlimited amount of inspections. (Other solutions charge $5/inspection or start out at $50/month). Watch the Tutorial below to discover how to sync your Rentec Direct rental properties with zInspector. Instructions for this task are also listed below. This short tutorial also goes over how to preform a move-in inspection. Sign Up for a free zInspector Account. zInspecotr Timeline shows all the property inspection data over time. You can see all your photos and videos, run various reports, look at PDFs, run filters. You can take your property list from Rentec Direct and sync it with zInspector. zInspector has a very robust and useful mobile app, but for setting up your Rentec Direct sync, it will be easiest to complete on a laptop or desktop computer. Login into your zInspector Account. Select “Rentec Direct” from the drop down list. Click the link for www.rentecdirect.com, which will open a new tab. Log into your Rentec Direct account. Click on the Settings Tab in your Rentec Direct account to find the API key to sync with zInspector. Click on Utilities in your Settings Tab. Click on the Clipboard icon next to the zInspector Key box, to automatically highlight and copy the API key. Once you have copied the API key, go back to your zInspector account and the Accounting Software Integration page you previously opened. Under the Link: section, click on the Add/Change button. Paste the API key into this box and click Ok.
Hit the “Enable” button at the bottom of the page. These are the steps to automatically synchronize your zInspector account with your Rentec Direct property data. Check it out by clicking on the “Properties” tab in your zInspector account. If you add a property, archive a property, or increase the number of bedrooms, or make any other changes to your property information in your Rentec Direct account, all those changes are going to be reflected in zInpsector. You can also manually enter property data into zInspector or upload a spreadsheet. You will be able to see your single family homes and multif properties, with individual units listed, to easily complete move-in and move-out inspections. For multifamily properties, you will notice a “Common” section area where you can add areas to it, like the building exterior or roof, for items that you will need to inspect. Download the zInspector app from either the Google Play Store and/or the Apple AppStore and use your new zInspector login info consisting of your email address and password. Your property list should automatically sync with your mobile zInspector App every time you open the app. 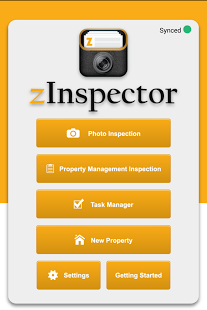 Open your zInspector app and select “Property Management Inspection”. Select the property you are going to inspect from the list provided. This is the same property information that was synced from your Rentec Direct account. Select the Type of Inspection. Enter the Name of the Tenant. You will see the template for your Inspection. There are tons of helpful videos from zInspector with tips for completing inspections via the mobile app–zInspector Help Videos. -One tip zInspector gives is to lable the bedrooms in the inspection template, like Master Bedroom instead of Bedroom 1. You can do this by clicking the Pencil icon on the top of the screen. When you are ready to inspect, open the room/area tab you want to inspect and you will see the features you need to inspect.
! – Needs Attention (Opens a screen to specify what works needs to be done and rate the importance). Select the Text Box quote image to enter comments about the property feature you are inspecting. You will also have the option to add in Smart Comments to make the process faster. You can take a photo directly from within the app of a property feature that is damaged or requires attention. You can also take videos. Once an inspection is complete, you will be emailed a report and the information remains accessible in your zInspector account. How Much Does zInspector Cost? zInspector is free for anyone with under 5 units and starts at $12/month for 1 user with unlimited properties to conduct an unlimited amount of inspections. (Other solutions charge $5/inspection or start out at $50/month). For more information, contact support@zinspector.com. Wow! Rentec provides an inspection app, amazing! Now I am managing my properties with the help of Rentec I was hoping I could find an inspection software. Can’t wait to try it! Rentec development team doesn’t waste any time! Thank you for updating users with latest updates to the software! I gave zinspector a try. I really do feel this functionality could exist within the software without the use of a third party. Appfolio and competitors alike offer this, seems like this could be added in future versions. Hi Michael, thank you for your comment and feedback. zInspector has a lot of functionality, much of it in their mobile app, that makes doing mobile inspections easy. Rentec’s developers are busy at work (way too busy in fact) working on about 3000 feature requests we have in queue. But when we found out about zInspector, we realized that we could quickly bring you these features to our clients immediately instead of waiting months (or maybe years) in the development queue. Who knows what the future will bring, but for now we’re very pleased with the feedback we’ve gotten from users on zInspector. Other solutions that designed their own inspection app for their pm software have received poor reviews. We decided to stick with the experts and integrate with a third-party mobile inspection app that has great reviews, which is why we went with zInspector. Great that you can attach an image. Could you also draw on it using touch screen? “For multifamily properties, you will notice a “Common” section area” – this is also great. Good news! zInspector does have a mark up feature, like the one you are asking about. Here’s how to use it: On the inspection screen there is a slider that says “Photo” if you tap it, it will change to “Mark-up”. For the next photo you take, after you take it, it will allow you to draw on the photo. Two copies of the photo is saved…one with the drawing and one without. I am a rentec direct user. Besides allowing one to sync with zinspector app and transfer details of the properties what else is integrated. Can one look at the inspection report in rentec. Can one allow others like tenants or landlords look at the inspection reports when they access their account on rentec . All i see is the integration is how to sync up the properties “from rentec” to Zinspector so one does not have to type the data again in zinspector. If you would like your tenants or other owners to view the inspection reports, you can download them as a pdf from zInspector and upload them into the Rentec Direct File Library to share with your tenants and/or owners to access in their Portals. Currently the zInspector tool works the way you described, with your properties syncing from Rentec to zInspector. Future development is being discussed to create the sync back to Rentec from zInspector.